We were invited to a BBQ dinner last night and were asked to bring a salad. Instead of making a typical salad with veggies, I decided to spruce it up Italian style with ingredients that are in season. 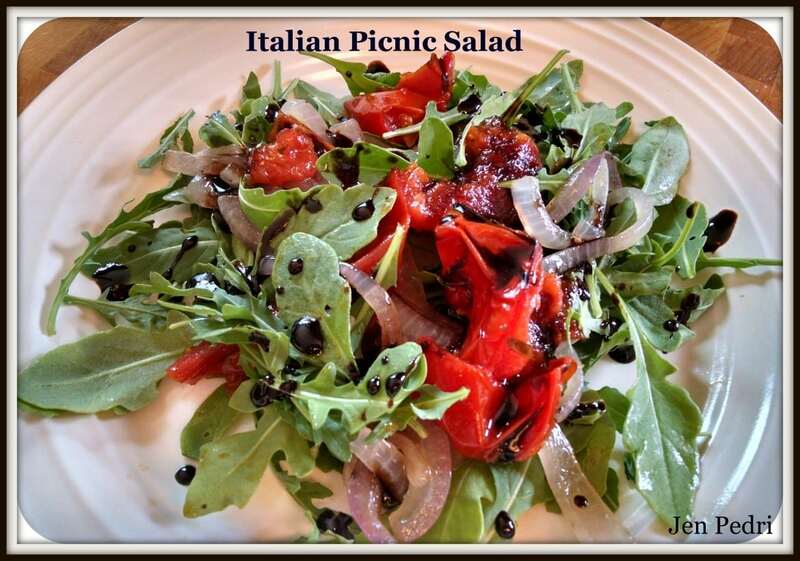 My Italian Picnic Salad takes a little bit of planning ahead but the results are well worth it. Bon Appetite! Preheat oven to 400° and cut tomato into quarters. In a large bowl add garlic, basil, oregano, ¼c olive oil and a dash of salt and pepper to tomatoes and mix. Place tomatoes in the oven for 20-25 minutes. 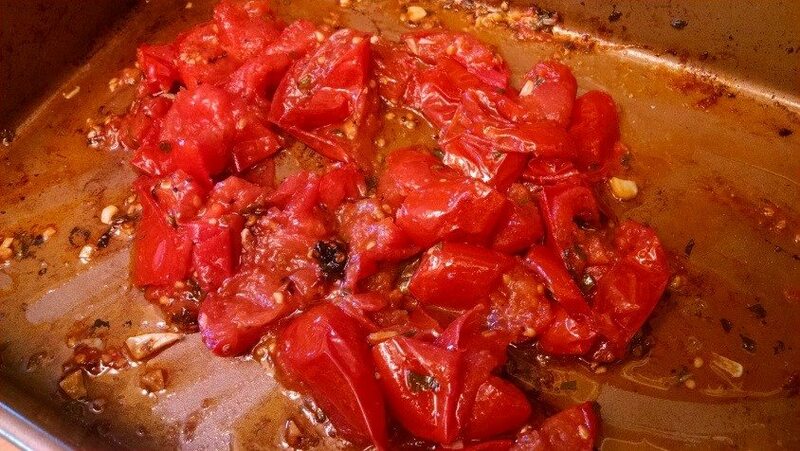 You get more of an intense flavor when you roast the tomatoes. 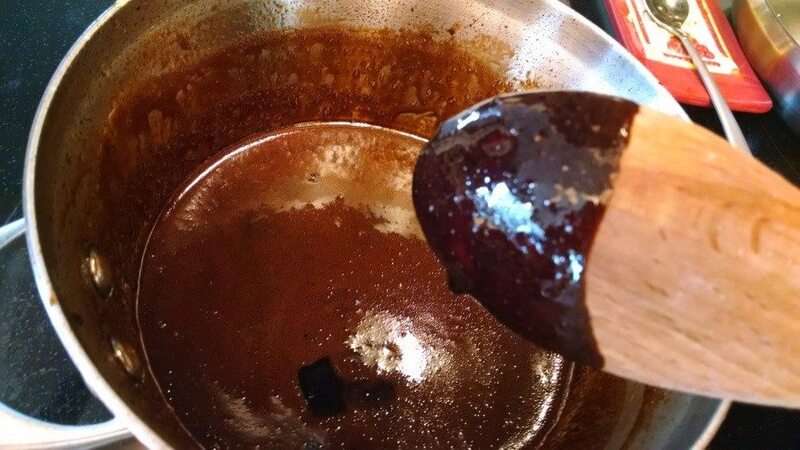 While the tomatoes are roasting, place the pint of balsamic vinegar and honey into a pot and bring to a simmer. You want the vinegar to reduce to a syrup, aka a reduction. This took me about half an hour or so. Make sure to stir occasionally so as not to burn the vinegar. It will be done when it leaves a nice coating on the back of a spoon. 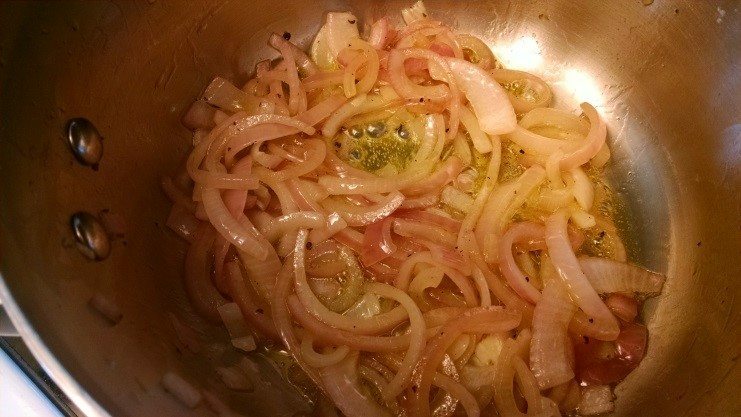 While the vinegar is doing its thing, heat up a pan with the remaining 1tbs of olive oil and place the sliced onion in, add a dash of salt and pepper. I still wanted the onion slices to have a chew to them so I sweated them out for 10-15 minutes. Let all ingredients cool, and then in a large bowl, mix the arugula, roasted tomatoes, onions and mozzarella cheese. Drizzle the balsamic reduction on top. I prefer to serve this salad at room temperature. Preheat oven to 400° and cut tomato into quarters. 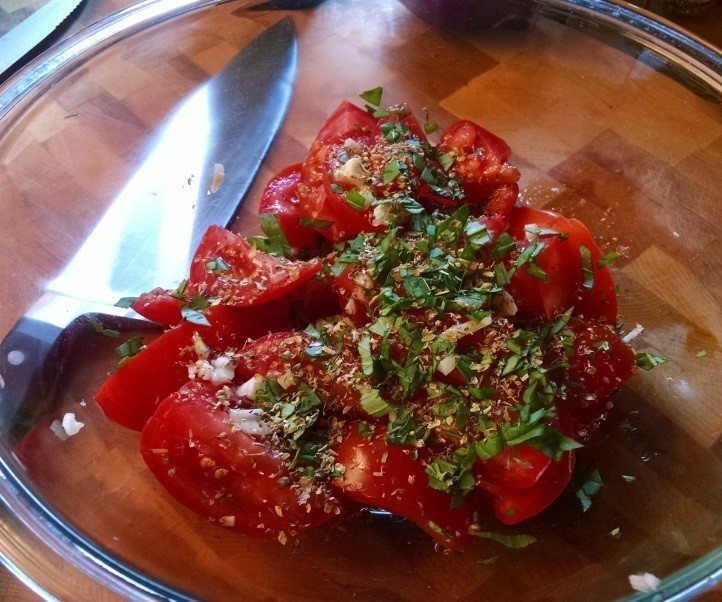 In a large bowl add garlic, basil, oregano, 1/4c olive oil and a dash of salt and pepper to tomatoes and mix. While the vinegar is doing its thing, heat up a pan with the remaining 1tbs of olive oil and place the sliced onion in, add a dash of salt and pepper. I still wanted the onion slices to have a chew to them so I sweated them out for 10-15minutes. This recipe is grain free, gluten free and primal. What do you like to eat on hot summer days? Do you have questions for Jen about this recipe or Paleo or Primal eating? Comment below. NextAre You Balanced in the 4 Areas of Life? 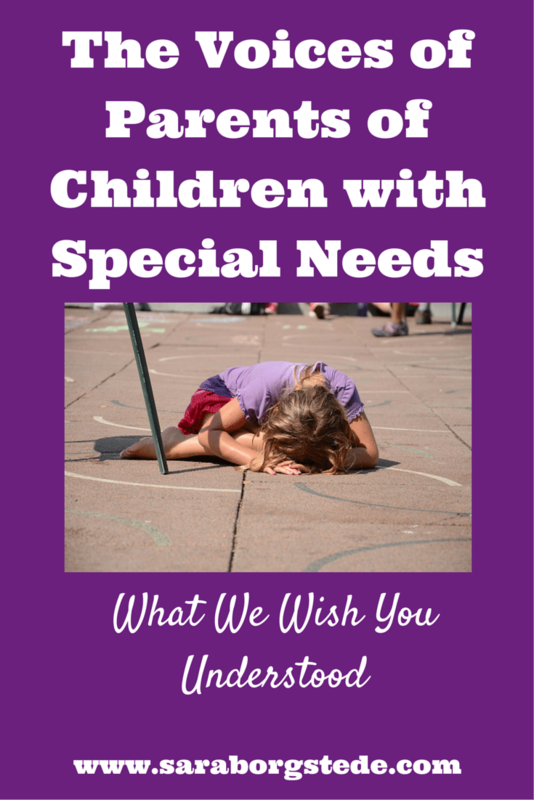 Thanks for the link up on your website, Lisa!